The Individuals with Disabilities Education Act (IDEA) calls for a team of individuals, including parents and school personnel, to work together to develop an Individual Educational Program (IEP) for a child who qualifies for special education services. Because IEP decisions are made by a team rather than by any one individual, it’s important and helpful to understand the role of each member. While each person brings a different set of experiences, concerns, and skills to the table, you can expect that they all share a common goal: enabling the child to succeed in school and in life. The school district representative is a required IEP team member. The individual must be licensed to provide or supervise special education and be knowledgeable about the general education curriculum and the availability of resources of the school district. In Minnesota, the child’s teacher may not serve in this capacity, although another member of the team who is otherwise qualified may also be designated to represent the district. The designated representative is frequently a special education director or coordinator or a school principal. In this role, the individual must have authority to commit the resources necessary to implement the plan agreed to by the IEP team. Provides information regarding the array of services available in the school district. Represents the interests of the school district and school district personnel, including regular and special education. Commits agency resources to ensure that services in the IEP will be provided as agreed upon by the team. If it’s not clear to you who is serving as the district representative in an IEP meeting, be sure to ask. You may wish to ask to reschedule a meeting at which there is no district representative in attendance. Decisions requiring the commitment of resources are to be made in the team meeting and do not require additional approval after the meeting. At least one regular education teacher is required to participate as an IEP team member if the child is, or may be, participating in a regular education environment. This teacher should be a teacher who is, or may be a teacher of the child. This teacher will be responsible for implementing a portion of the IEP and can participate in discussions about how to best instruct the child. When a student has more than one regular education teacher, parents may request that particular teachers attend a meeting, but the school may decide which teacher or teachers will participate, based on the interests of the child. The regular education teacher has knowledge and expertise about the content of the grade-level general curriculum--the subject matter all children are being taught--as well as the classroom structure, environment, expectations and daily schedule. Provide information about the student’s participation, performance, progress, and interaction with their peers in the regular classroom. Share information about the general curriculum. Identify areas of concern and determine appropriate positive behavioral interventions and supports and other strategies for the child to be meaningfully included in the classroom. Identify needed training, materials, or other classroom support teachers may need in order to help the student benefit from classroom instruction. Make recommendations about individualized learning strategies and effective accommodations to be used in the classroom and school community. Suggest ways parents can approach homework and other opportunities to reinforce learning at home. Parents often choose to invite the teacher who has the most positive relationship with the child. However, it may be very beneficial to invite the teacher of a class your child finds particularly challenging. The teacher may become better informed about the child, and the student’s needs may be addressed more effectively by the team. The special education teacher is a required IEP team member and plays a central role in IEP planning and program implementation. Special education teachers have received teacher training specific to particular areas of disability and are licensed in one or more special education categories. They have expertise about the disability and its impact on the student’s developmental and educational progress. Provide current information, research, student assessment, and progress reporting data to guide the team in making IEP decisions. Make recommendations about individualized learning strategies, teaching methodology, and effective accommodations in the classroom, home and community. Help regular educators adapt their teaching techniques and individualize or modify curriculum in the classroom. Locate alternate teaching materials, assistive technology devices, and other needed resources. Assist the team in finding ways to include the student in all aspects of the regular school program, including extracurricular activities. The special education teacher is often assigned the role of IEP manager. The IEP manager is responsible to coordinate the delivery of special education services and to serve as the primary contact for the parent. Before a team meeting, ask the special education teacher to send you copies of any information the team will be using at the meeting to make decisions about your child’s school program. By reading and processing the information ahead of time, you will be better prepared to be an informed and active participant at the meeting. Long after the last teacher or therapist has disappeared from your child’s life, you will be there to support and encourage your child. Your active participation as a member of his or her IEP team will help to ensure that your child receives the education he or she needs and deserves. You are the expert on your child. Your in-depth, ongoing relationship provides you with a wide-angle view of the child. Professionals often see the child through the lens of their particular area of expertise. 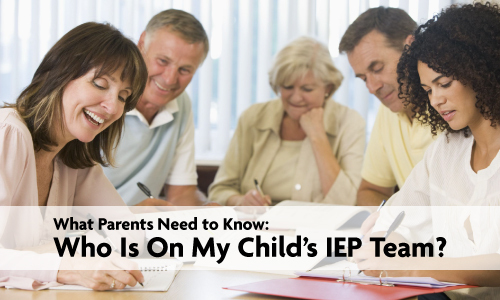 Parents are the only continuous members on a child’s IEP team. You know what has worked and what hasn’t worked over time. You will be the one constant factor through multiple transitions at school and in life. Professionals will change from year to year. The parent is the IEP team member who represents and advocates solely for the individual child. School personnel are responsible for many children and must be concerned with meeting all their needs. You are the keeper and communicator of high expectations for your child. No one cares about your child’s success as much as you do. Read the notices, reports and documents the school provides. If you don’t understand something, ask for clarification. You may need to sign that you agree or disagree with a proposed action. Whenever possible, complete and return forms within requested timelines. Learn the basics of special education and the IEP process. Become familiar with student and parent rights and school responsibilities. Clearly communicate your family’s goals and concerns for your child. Help set priorities. Help your child to actively participate in the IEP process as much as is appropriate. Ask them what is working well for them at school and what help they need. Make sure they have the opportunity to communicate their interests, concerns, strengths, and preferences. In meeting, keep the focus on your child. Become as informed as possible about your child’s school program. Gather information, ask questions and when possible, observe. Listen to and consider other team member’s input. The strength of a team is the different perspectives each member brings. Monitor your child’s progress on IEP goals and in the general curriculum. Provide feedback to the team. Alert the team to lack of progress or other concerns. Celebrate successes and let people know when they are doing a good job. Everyone likes to be on a winning team. Make it a habit to use “we” language whenever possible. “You versus us” statements set you in opposition to the rest of the team. By using language that includes yourself as a part of the team you increase the likelihood that the school will, too. * - “Parent” refers to a parent, guardian or surrogate parent.